The Youngstown State women's soccer team closes out its eight-match homestand when it hosts defending Horizon League champion Valparaiso, Saturday, Sept. 26, at 7 p.m. at Farmers National Bank Field. The Penguins are coming off a 2-1 win over St. Bonaventure on Sept. 20 after dropping their Horizon League opener to Northern Kentucky, 3-1, on Sept. 18. Sophomore Kyler Lum scored two of the Penguins' three goals last week, which were the first of her career. The Penguins have been more successful find the back of the net recently compared to the start of the season. After scoring just three goals in their first six matches, the Penguins have scored eight goals in the last four. Over the last four games, the Penguins are 3-1. Sophomore Kyler Lum scored her first two career goals last weekend. Lum posted her first score in a 3-1 loss to Northern Kentucky on Sept. 18 and was credited with the game-winning goal in a 2-1 win over St. Bonaventure on Sept. 20. This is the 15th meeting between Youngstown State and Valparaiso in a series that dates back to 1999. The Crusaders own a 10-1-3 advantage in the all-time series and have won the last two matches. Last season, the Crusaders won 1-0 in overtime and defeated the Penguins, 1-0, at Farmers National Bank Field in 2013. The Penguins lone win in the series was a 1-0 victory at Valparaiso in 2012. The Penguins defeated the Crusaders in a shootout during the 2008 Horizon League Tournament, but that match is technically recorded a tie. The Crusaders enter the match with a 2-3-3 overall record and a 0-0-1 mark in the Horizon League. Valpo tied Wright State, 1-1, on Sept. 19. Leading the Crusaders is Rita Craven and April Cronin with four goals apiece. Goalkeeper Sydney Galvez-Daley owns a 2-1-3 record with a .741 save percentage. Sophomore Katie Hackos (York, Pa.) was named the Horizon League Women's Soccer Offensive Player of the Week, the league announced on Sept 14.Hackos, a telecommunications major with a 3.31 GPA, led Youngstown State to a pair of wins against IPFW and Findlay, scoring a goal in each match. 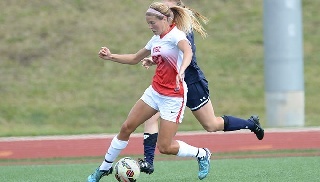 She scored her first career goal giving YSU a 1-0 lead in the Penguins' 2-1 against IPFW on Friday. On Sunday, she added her second goal to tie the match 1-1 in YSU's 3-2 overtime win over Findlay. Hackos, who earned the first weekly award of her career, took a total of eight shots and had five shots on goal. Sophomore Kyler Lum has definitely taken her chances at the net. Lum leads the Penguins and ranks tied for fourth in the league with 24 shots and seventh with 2.40 shots per match. Senior defender Macey Riese has been taking advantage of her rare offensive opportunities over the past two seasons. After not attempting a shot during her freshman and sophomore seasons, Riese has tallied three goals, 17 total shots and six shots on goal over the last 26 matches. She ranks third on the team with nine shots. Riese posted her first career game-winning goal in a 3-2 overtime win against Findlay on Sept. 13. Freshman Alison Green stepped up big for the Penguins in a crucial moment. Green, who is tied for the team lead in scoring with Katie Hackos and Kyler Lum, scored her second career goal in a big moment. Trailing Findlay, 1-0, in the first half, Green tied the match up in the ninth minute. Green took a cross from Alex Kitchart in the left corner and pushed a shot into the lower left corner of the goal. The Penguins play their first road contest since Aug. 28 when they visit Cleveland State, Wednesday, Sept. 30, at 7 p.m.